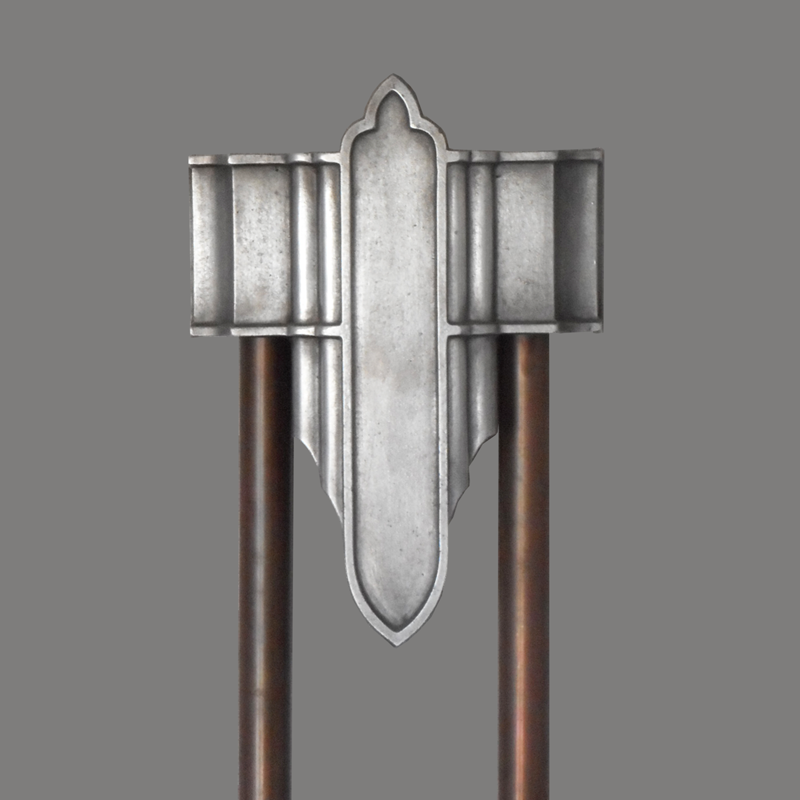 The C. Vincent Mell-O-Chime features a medievel style. This chime is as found, although the cover may once have had a bronze or brass painted finish. 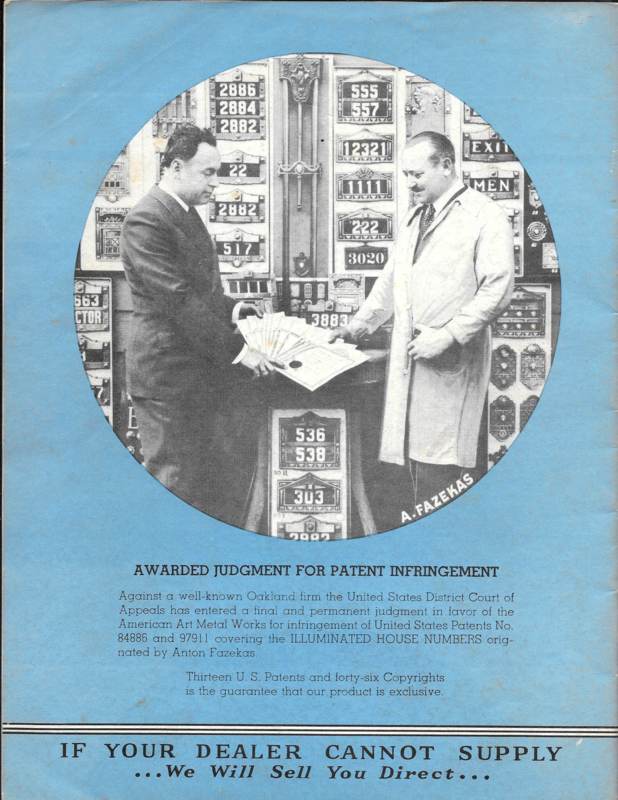 Marked “Mell-O-Chime” and “Mfg. by C.Vincent Alameda” This chime is one of several in the museum from California manufacturers. 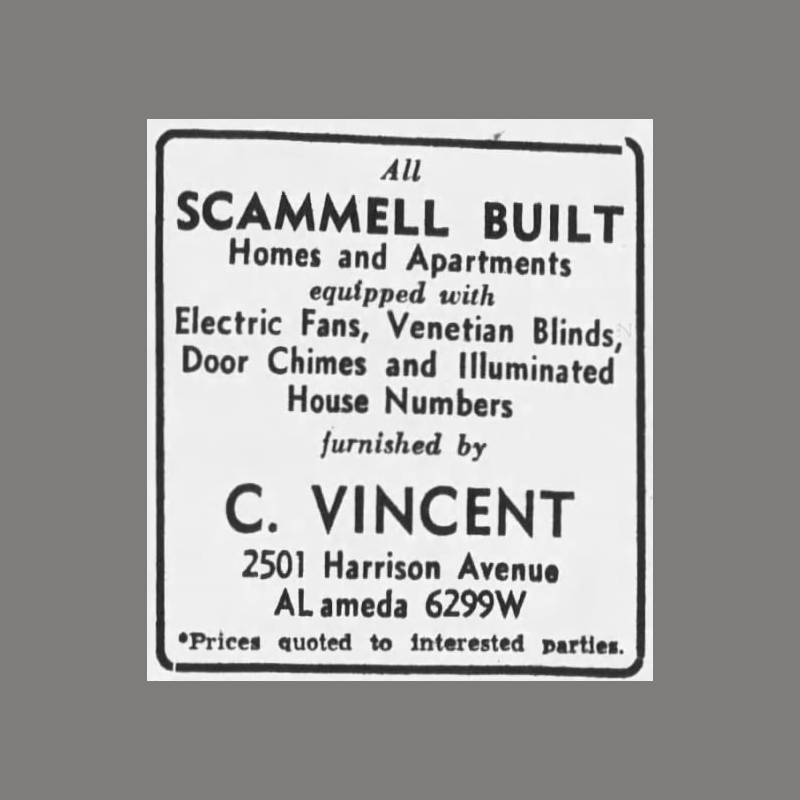 I’m able to find little about C. Vincent, although the firm did supply door chimes, illuminated house numbers and other hardware for homes built by John Walter Scammell, a developer responsible for many homes in the fashionable city of Piedmont which is entirely surrounded by Oakland, California. This C.Vincent Mell-O-Chime door chime should not be confused with products from the Mello-Chime and Signal Corporation (sometimes Mell-o-Chime) of Chicago, Illinois. 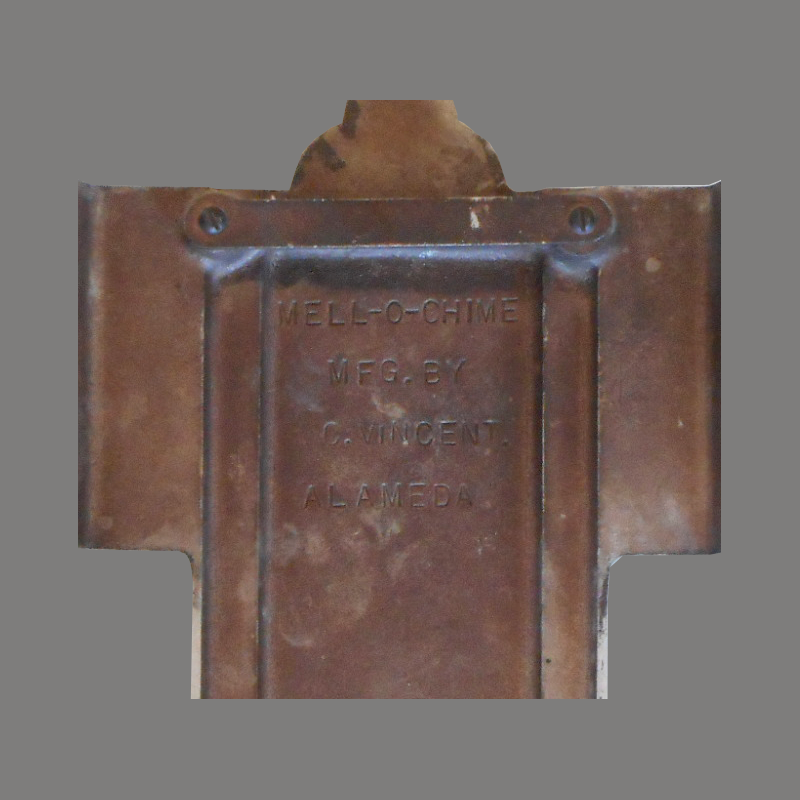 Permutations and fanciful spellings of the word “mellow” were commonly used in the names of various door chime manufacturers to distinguish their products from doorbells and buzzers. Still, this nearly identical name is, at best, confusing. 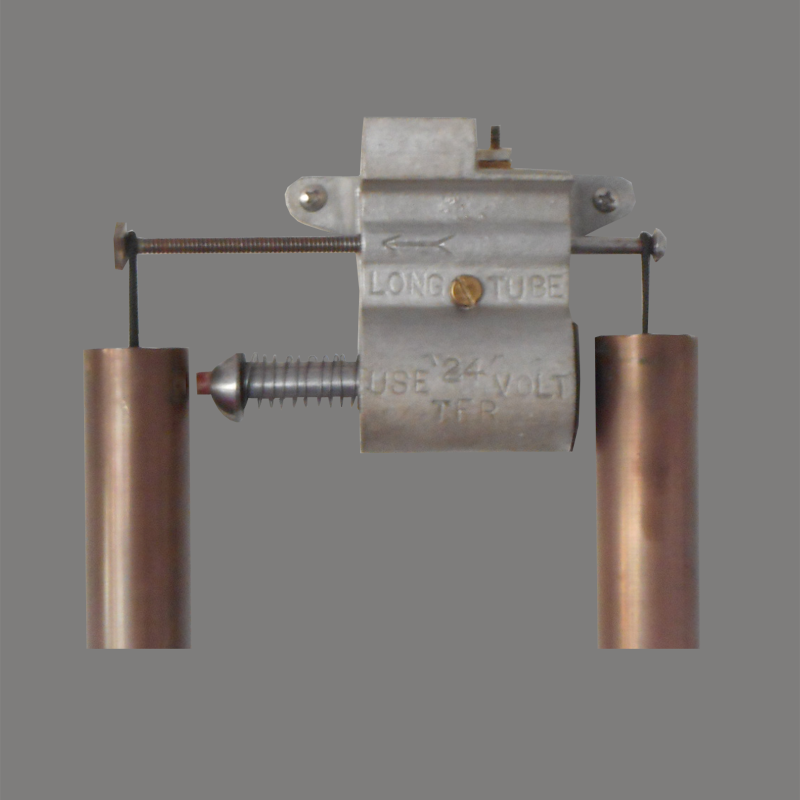 This C. Vincent chime’s cast pot metal mechanism is also extremely similar to the Model 810 mechanism employed on American Art Metal door chimes. Like the American Art Metal and Maas chime, C.Vincent molded tube placement instructions and electrical requirements into their mechanism. C. Vincent may have gone a bit too far in borrowing ideas for products. American Art Metal won a lawsuit for patent infringement on illuminated house numbers against a “well known Oakland firm”. The address for C. Vincent is in Oakland even though this cover’s markings list the neighboring city of Alameda. Perhaps the C. Vincent foundry was in Alameda with offices at 2401 Harrison Avenue in Oakland. Regardless of the provenance of this chime, it’s an interesting bit of California door chime history. Notes ElectraChime Collection. Original Condition (as found).